Former Doctor Who Christopher Eccleston today surprised our iconic “blue coat” volunteers and team behind Hull City of Culture 2017 with the news they have been voted Best Arts Project in the National Lottery Awards. The actor made the announcement to the group, who had gathered to reminisce about Hull’s success as City of Culture, at Humber Street Gallery. 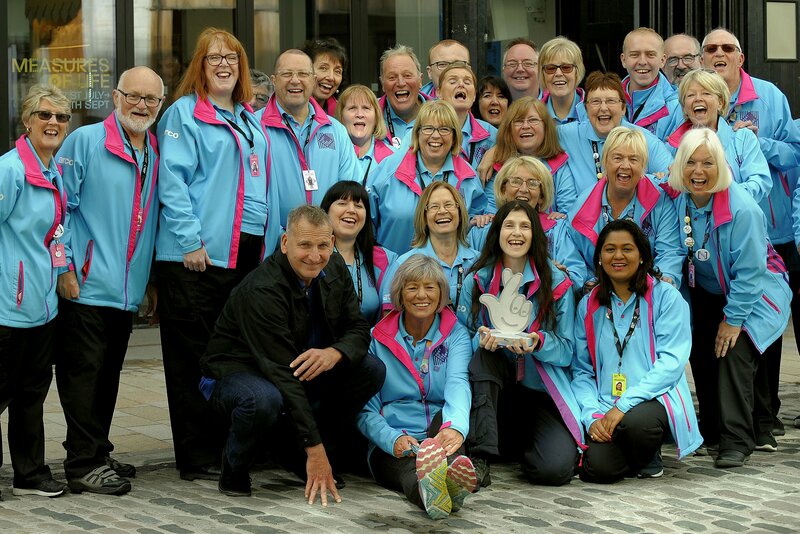 The National Lottery Awards are the annual search for the UK’s favourite Lottery-funded projects and celebrate the inspirational people and projects who do extraordinary things with National Lottery funding. Christopher, who has spoken about the importance of representing the Northern England in the arts, spent time meeting some of those behind the year-long cultural festival; which was made possible thanks to £10 million of National Lottery funding. He said: “It’s thanks to National Lottery players, who raise £30 million each week for good causes that amazing projects, like Hull City of Culture 2017, are possible and I’m delighted to announce them as winner of the UK’s Best Arts Project in the National Lottery Awards 2018. Hull’s year as the UK’s City of Culture transformed the city’s cultural and economic landscape and attracted millions of people to a vibrant programme of events. The National Lottery was the biggest funder for the project. The programme attracted an audience of 5.3 million over 2,800 events, cultural activities, installations and exhibitions. An army of 2,400 volunteers kept events running smoothly. Katy Fuller, Creative Director and CEO of Hull 2017 legacy organisation Absolutely Cultured, said: “This news is incredible, not only for us here at Absolutely Cultured but for the entire city and everyone who was involved in making Hull’s year as UK City of Culture such a tremendous success. “From the team involved in the bid, to the volunteers, partners, creative organisations, artists, Hull 2017 team and the audiences who joined us, the Hull 2017 story was a truly collaborative effort and an example of what is possible when an entire city comes together. Hull City of Culture 2017 beat off competition from 700 entries to win £5,000 cash prize and an iconic National Lottery Awards trophy and will have its work celebrated on a special BBC One programme to be broadcast on the 26 September. National Lottery players raise £30 million a week for arts, sport, heritage and community good causes. For more information go to www.lotterygoodcauses.org.uk or follow the campaign on Twitter: hashtag #NLAwards.